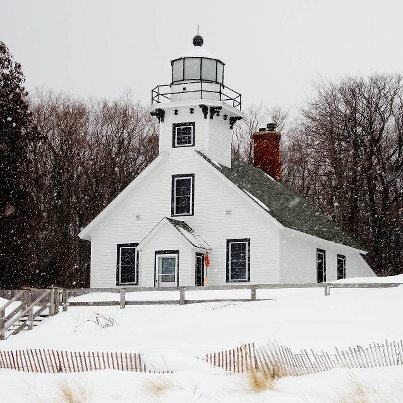 While Grand Traverse Bay provides a scenic refuge from the powerful winds of Lake Michigan, it is also home to a geographically important lighthouse. Not only is Mission Point found in one of the finest wine growing regions in the country, it is located near the 45th parallel, which is the halfway point between the Equator and the North Pole. 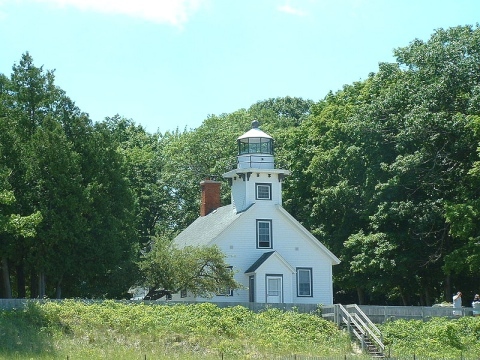 Built at the tip of Old Mission Peninsula in northern Lower Michigan, the lighthouse at Old Mission Point overlooks Grand Traverse Bay and has long been a popular attraction for visitors. While the area is now celebrated for its natural beauty and vineyards, permanent settlement didn’t come to the peninsula until 1839 when a Presbyterian mission was founded at what eventually became Old Mission Harbor. The few Native Americans who lived nearby coexisted peacefully with the new community established by Reverends Peter Dougherty and John Fleming. The next decade saw such increased growth in both the Native American and European population that at least one schooner made weekly trips from nearby Mackinaw City with supplies. When Reverend Dougherty established yet another community across the western side of the bay in 1852, it was referred to as the New Mission, and the original settlement became known as the Old Mission. 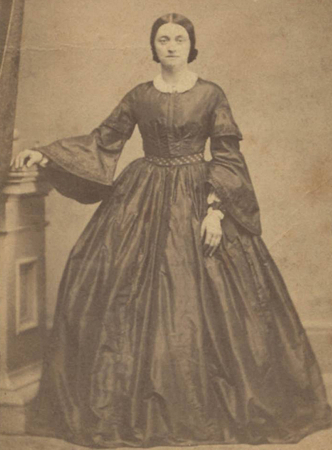 Missionary activity on the peninsula came to an end in the 1860s due to financial problems. By then the community was well established, boasting both a school and a post office. In the latter half of the nineteenth century, the region became a thriving center for agriculture, lumber and iron foundries. This naturally led to an increase in maritime traffic in West Grand Traverse Bay. 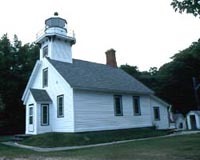 Due to the bay’s shoals and reefs, a request was made to the government for a lighthouse on Old Mission Peninsula. This demand became more urgent when a ship crashed against a shallow reef and sank. Congress allotted $6000 for a lighthouse to be built at the spot where the ship went down, but the Civil War intervened. Construction of the lighthouse was not completed until 1870. 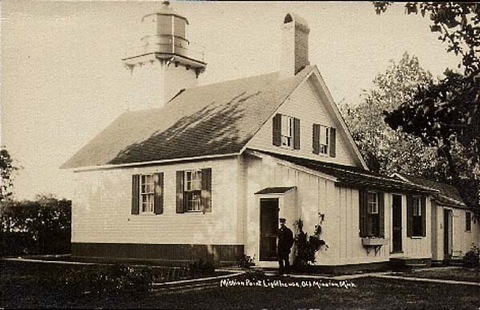 The new structure was a replica of the 1849 harbor light off Mama Juda Island in the Detroit River. Like the Mama Juda harbor light, Mission Point has a square tower, was built from timber, and painted white with a black trim. (Due to erosion, the Mama Juda lighthouse was destroyed in 1950, and the small island suffered the same fate within a decade.) 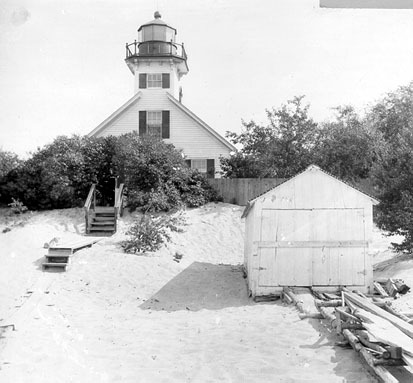 The original lighthouse at Mission Point had two floors, six rooms and a tower room for the lens. 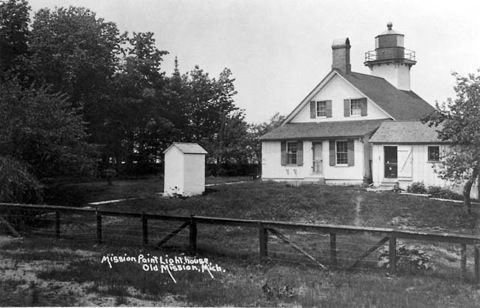 First lit in 1870, Mission Point used a 5th Order Fresnel Lens for its entire sixty-three years as an active light. The Lens, which could be seen twelve miles away, was fueled first by whale oil, and then kerosene. Unfortunately, it disappeared when the Coast Guard shut down the facility. Decades later, the Coast Guard made amends for this loss when they loaned a 5th Order Fresnel Lens to Mission Point in May 2011. It now sits proudly on display in the lighthouse museum. The lighthouse underwent further renovation in 1889. At that time, a brick cistern was added. More importantly, a wooden structure known as a revetment was built in front of it as an effort to restrict the erosion caused by the sandy soil. The first keeper was Jerome Pratt, Sr. who kept the light from 1870 to 1877. Pratt was followed by keepers John McHaney. John Lane, Sarah Lane, James Davenport, William Green and Emil Johnson. For over two decades, Captain John Lane and his wife Sarah worked together to keep the light. When John died, his wife Sarah continued on, becoming the only woman to serve alone as lighthouse keeper at Mission Point. When the last keeper Emil Johnson left in 1933, the lighthouse was officially deactivated. By that time, automation of a light on the actual shoal was found to be more effective than the old lighthouse. In 1938 a 19-foot tower with a battery-operated light was constructed on a pier two miles northwest of Mission Point. Mission Point remained abandoned until 1948 when local residents collected money that enabled the township to purchase the buildings and surrounding property. Caretakers now maintain the building and grounds, and Mission Point has been added to the National and State Historic Register. Visitors are welcome to tour the tower and the lighthouse museum. In addition, Mission Point has a popular Lighthouse Keeper program, which allows volunteers to actually live and work at the lighthouse. For lighthouse fans, there is perhaps no better way to enjoy Grand Traverse Bay than a few days spent ‘keeping the light’. Ladies of the Lights: Michigan Women in the U.S. Lighthouse Service by Patricia Majher, University of Michigan Press, 2010.